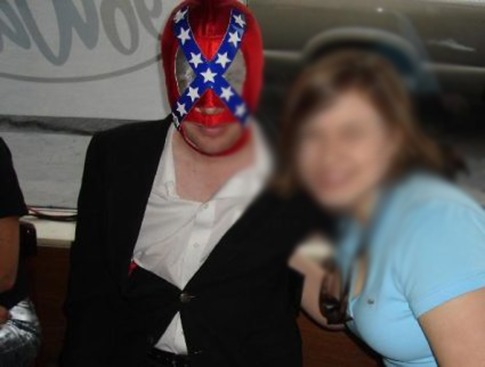 Jack Hunter, who co-authored Rand Paul's 2011 book and now directs new media for the Kentucky senator, has a past alter ego as the "Southern Avenger," a provocative radio personality known for wearing a luchador mask emblazoned with the Confederate flag and for making outrageous comments about race and Southern secession, Alana Goodman of the Washington Free Beacon reveals today. As the arguably white nationalist Southern Avenger, Hunter praised the assassination of Abraham Lincoln, saying he “raise[s] a personal toast every May 10 to celebrate John Wilkes Booth’s birthday," compared Lincoln to Saddam Hussein, and suggested the great American president would have had a homosexual relationship with Adolf Hitler, had the two ever met. He also advocated against Hispanic immigration and in favor of white pride, warning that a "non-white majority America would simply cease to be America." And the worst part for Paul-land is that it's hardly the first time something like this has come up. In late 2009, Rand Paul's campaign spokesperson was forced to resign after Kentucky blogger Joe Sonka discovered the MySpace page for Chris Hightower's heavy metal band, which was a fan of KKK gear and wishing people a “HAPPY N***ER DAY!! !” on Martin Luther King Day (that post was accompanied by a photo of a lynching). There was also, of course, Paul's momentary opposition to the Civil Rights Act of 1964. As Dave Weigel pointed out on Twitter, "Jack Hunter was the Ron Paul 2012 campaign's main blogger. Not like he appeared out of nowhere." And the elder Paul has seen his own problems here, after a trove of dozens of racist newsletters sent under his name emerged two years ago. Paul denied writing them, saying they were ghostwritten and he didn't read them closely enough before giving approval to attach his name. And here's a video of Ron Paul last year in front of a giant Confederate flag giving a speech essentially saying the South was right in the Civil War (but not about the slavery part). Paul has also invited neo-Confederate activists to testify before Congress. And then there's the cast of characters on the advisory board of Paul's new post-retirement political organization. It'd be bad for any politician, but Rand Paul has tried to build a brand that sets him apart from the rest of the GOP and to make himself more appealing to non-typical Republican voters, like minorities, so the damage could be especially severe. An interesting side note is the fact that the FreeBeacon, a conservative publication, broke the story. The website has staunchly pro-Israel views and tends to side with the muscular foreign policy wing of the movement, which is often at odds with Paul's anti-interventionist views. UPDATE: In September of 2010, Paul's Democratic opponent called on him to return $1,200 in donations from three "white separatists," Virginia Abernethy, William Johnson and Carl Ford. Paul refused, with a spokesperson telling the Louisville Courier-Journal: "Dr. Paul condemns hatred and discrimination, and if the white separatists who donated to his campaign think he shares their views they are badly mistaken and would be in for a rude awakening when they see that 20% of his campaign staff is made up of African-Americans." The state chairman of the League of the South was also involved in a Paul-affiliated organization.